West Edge Opera announces a new venue for its upcoming festival: Pacific Pipe Oakland at 1391 W. Grand Avenue in West Oakland. The West Edge Festival 2017 runs August 5 – 20 and includes Thomas's Hamlet, Larsen's Frankenstein, and Martin y Soler's The Chastity Tree. An abandoned warehouse, Pacific Pipe Oakland was once in the center of Oakland's thriving industrial market. The Pacific Pipe Company established the West Oakland warehouse, built between 1920 and 1925 by Harry Leach, as the third and final outfit of the company's operations, which also included locations in San Francisco and Los Angeles. Pacific Pipe Oakland was touted as the largest reconditioning pipe plant in the West, eventually complementing its work on old material with the distribution of new steel and iron pipe. By 1930 the Oakland plant employed around 100 people and handled over one million feet of pipe each year. In the 1960s, to accommodate growing operations, a third wing was added to Pacific Pipe Oakland. This third wing is the home of the West Edge Festival 2017. 11 West Partners acquired Pacific Pipe Oakland and the surrounding complex in 2016. The complex also includes the neighboring American Steel Studios, one of Oakland's best-known cultural hubs, which served as the venue for the West Edge Festival 2015 production of Monteverdi's Ulysses. West Edge Opera will be the first to present a live performance in the Pacific Pipe Oakland warehouse. This venue change comes after the City of Oakland denied permits for the 16th Street Station, West Oakland's abandoned train station and the proposed host of the West Edge Festival 2017, earlier this spring. The 16th Street Station served as the venue for the entire West Edge Festival 2016 and part of the 2015 season. The previous Evening @ The Station event has been renamed to Evening @ Pacific Pipe, a fundraiser in the warehouse on July 30. 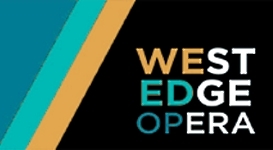 Single and series tickets, which offer a 10% discount, are on sale now and may be purchased at www.westedgeopera.org or by calling 510-841-1903. Friday August 4, 8:00 p.m.
Saturday August 5, 8:00 p.m.
Sunday August 6, 7:00 p.m.
Thursday August 10, 8:00 p.m.
Friday August 11, 8:00 p.m.
Saturday August 12, 8:00 p.m.
Sunday August 13, 2:00 p.m. The acclaimed Merola Opera Program, one of the most prestigious and selective opera training programs in the United States, continues its 2017 Summer Festival with a Merola favorite, Rossini's La Cenerentola, Thursday, August 3 at 7:30 pm and Saturday, August 5 at 2 pm at the San Francisco Conservatory of Music. Mezzo-soprano Samantha Hankey, a 2017 winner of the Metropolitan Opera National Council Auditions, sings the role of Angelina, and Prince Ramiro is sung by tenor Anthony Ciaramitaro. Mezzo-soprano Edith Grossman is Tisbe, bass baritone Andrew Hiers is Don Magnifico, and Clorinda is sung by soprano Natalie Image. The role of Dandini is portrayed by bass-baritone Christian Pursell, and Alidoro is sung by bass-baritone Szymon Wach. Mark Morash, Director of Musical Studies for San Francisco Opera, conducts, and Chuck Hudson is the director. Tickets for the performances range from $50 to $75, with a limited number of $15 student tickets available, and are on sale at San Francisco Opera Box Office at (415) 864-3330, merola.org or www.sfopera.com. Artis-Naples announced the appointment of Radu Paponiu as assistant conductor of the Naples Philharmonic and director of the Naples Philharmonic Youth Orchestra for the 2017-18 season. Paponiu will join the organization in September. "We are pleased to bring an exciting young artist of Radu's caliber to Artis—Naples," said CEO and President Kathleen van Bergen. "We expect he will play important roles in the continued growth of the Naples Philharmonic and enhancing the abilities of our student musicians." Added Sharon and Timothy Ubben Music Director Andrey Boreyko: "I am happy to work with a talented, emerging artist such as Radu Paponiu as we continue to create great artistic experiences for the Naples community." Paponiu previously conducted the Naples Philharmonic during the LinkUp education concerts in May. The Miami Music Festival opened Thursday, June 29 and continues Saturday July 1 with Offenbach's Tales of Hoffman. June 30 and July 2, 2017, 7:30 P.M. $15-35. Shepard and Ruth K. Broad Preforming Arts Center, Barry University, 11300 NE 2nd Ave.
Today, Ravinia announced the repertoire legendary violinist Itzhak Perlman will perform for audiences of its 51st annual Gala Benefit Concert. Adding to the previously announced program of Dvorák's Carnival Overture and Symphony No. 8 set for the July 29 Women's Board gala with the Chicago Symphony Orchestra conducted by Christoph Eschenbach, headliner Perlman will perform a suite of John Williams wonder--works written or arranged by the great composer--that includes "As Time Goes By" from Casablanca, the "Love Theme" from Cinema Paradiso, the theme from Far and Away, the main title theme ("I Had a Farm in Africa") from Out of Africa, the "Marian & Robin Love Theme" from The Adventures of Robin Hood, the theme from Sabrina, the theme from Schindler's List, and the tango "Por Una Cabeza," featured in Scent of a Woman. ctor and pianist Hershey Felder returns to the Wallis Annenberg Center for the Performing Arts (The Wallis) for the Los Angeles premiere of "Our Great Tchaikovsky," beginning Wednesday, July 19 through Sunday, August 6. Directed by Felder collaborator Trevor Hay, Hershey Felder's Our Great Tchaikovsky is a time-bending tale of music, politics and one of the world's most beloved composers. Known for his beautiful ballets Sleeping Beauty, Swan Lake, The Nutcracker, and the ferocious and melodic brilliance of his symphonic works, piano concerti, overtures, operas and chamber music, a healthy 53-year-old Piotr Ilyich Tchaikovsky conducted the premiere of his enigmatic Symphony No. 6, "Pathétique" and, nine days later, he was dead. To this day, how and why he died is still a mystery. Single tickets for "Our Great Tchaikovsky" are now available for $35 – $100 at TheWallis.org/Felder, and single tickets for The Great American Songbook Sing-Along are now available for $25 – $55 at TheWallis.org. For more information or to purchase tickets, visit TheWallis.org, call 310.746.4000, or stop by in person at the Wallis Annenberg Center for the Performing Arts Ticket Services located at 9390 N. Santa Monica Blvd., Beverly Hills, CA 90210. Encompassing haunting melodies, mysterious sounds, pristine ambience, minimalism, frenetic buzz, vintage sci-fi echo, complex patterns and at times powerful propulsive rhythms, Hauschka's "What If" album from earlier this year crowns an extraordinary run for Volker Bertelmann. He has found his presence as a film composer increasing, working on scores for a number of documentaries and feature films including James Franco's adaptation of John Steinbeck's In Dubious Battle and, alongside Dustin O'Halloran, Garth Davis's Lion, for which they were both nominated for an Oscar. Today, Bertelmann has announced North American tour dates for October, including dates in Brooklyn, Los Angeles, San Francisco, Chicago, and others. Additionally, he'll be playing live in various locations throughout the world in the summer too, starting with Germany in June and July. Celebrated in The New York Times as "a leader of a new generation of opera stars," mezzo-soprano Jamie Barton will share her rendition of "The Star-Spangled Banner" for the star-studded 41st Annual Macy's 4th of July Fireworks. The largest fireworks celebration in the country, the Macy's 4th of July Fireworks Spectacular will light up the New York City skyline for three million live spectators and will be televised across the nation on NBC beginning at 8 p.m. ET/PT. "It is an incredible honor and privilege to sing our national anthem for the Macy's Fourth of July Fireworks," Barton said. "I'm proud to be part of an inclusive celebration that unifies people – and music! – from many walks of life." "As past board presidents (and current board members), it is thrilling to see how far Philharmonia has come. PBO has grown from a regional orchestra to an ensemble with an international reputation. And if you saw Rameau's Temple of Glory, we think you would agree that PBO is unstoppable. It has been an enormous privilege to help lead this Orchestra over the years. But you are the reason that PBO is able to produce incredible music and tackle major artistic projects. We know how lucky we are to have Nic, Bruce, the Orchestra, and Chorale right here in the Bay Area. And PBO has arrived at a place where audiences in cities beyond also get to experience our unique brand of music-making. Your contributions are a testament to how much you care. We need your help now to end our year successfully." How Many New Operas Can AOP Fit into the Next Six Months? American Opera Projects is fitting in 16 more opera events - many of them free - before 2017 ends. Also, Schoenberg: A Survivor from Warsaw. Jane Marsh, Josephine Veasey, Placido Domingo, Sherrill Milnes; Chorus Pro Musica, New England Conservatory Chorus; Erich Leinsdorf, Boston Symphony Orchestra. RCA "High Performance" 09026-63682-2. How can this be? The two recordings represented on the disc were made in 1969, yet not only had I never heard the particular recordings before, I had never even heard of their existence before. I mean, it's not as though they are obscure pieces of music done by obscure musicians. The Beethoven Ninth is one of the staples of the core repertoire, Leinsdorf and the Boston Symphony have been leading names in the classical domain, and Domingo and Milnes are top singers in their field. In fact, RCA thought so much of the recordings they included them in this "High Performance" remastering series. Had I been asleep at the wheel all these years? 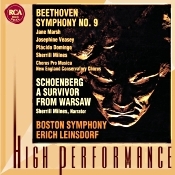 Anyway, the program starts with Schoenberg's A Survivor from Warsaw, a brief orchestral work with narration by Sherrill Milnes. It is a grim but inspirational comment on the subject of World War II death camps. A survivor tells the story of a group of Jews who just as the Nazis were about to deport them to camps burst into singing the prayer "Shema Yisroel." Schoenberg wrote it in 1947, having apparently heard the tale from an actual Warsaw survivor. It is severe, as it must be, but with great flourish and color, ending in a kind of spiritual exaltation. It makes an oddly appropriate introduction to the Ninth Symphony that follows. At a little under sixty-six minutes, Leinsdorf's Beethoven Ninth must be among the fastest and most exciting on record. Of the almost one dozen or so versions I had on hand (Schmidt-Isserstedt, Bohm, Solti, Jochum, Norrington, Karajan, Szell, Mackerras, Zinman, Wand, Karajan, etc. ), only Norrington's period-instrument account was marginally quicker. Leinsdorf's rendering is a star-studded performance where everything appears to fit together perfectly, the conductor leading his orchestra and the listener in disciplined, straightforward, military cadences that at times can actually stir the blood. Yet, at the same time, I couldn't help feeling that in the process of stimulating our passions, Maestro Leinsdorf had also drained some of the humanity out of the piece, that he had lessened the poetic lyricism to a larger degree than I would have liked. I can still appreciate Leinsdorf's recording, to be sure, and it does make a pleasant contrast to the more solemn and ceremonial interpretations that have come down to us through the years. Still, it wouldn't be my first choice in this material by any means. The sound is a bit top heavy and bottom shy, providing good detail at the expense of a natural concert-hall realism. Although there is not a lot of depth to the orchestra or chorus, there is plenty of left-to-right stereo spread and good dynamic shading. The merest touch of background noise reminds one of the recording date. Altogether, this seems a reasonable choice for remastering in RCA's "High Performance" audiophile line, if not, as I've said an absolute first recommendation for a Beethoven Ninth. 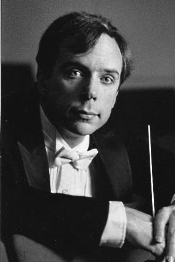 Lance Friedel, London Symphony Orchestra. MSR Classics MS 1600. I've said this before, but it bears repeating: listening to a Bruckner symphony can take patience. A lot of this has to do with the fact that Austrian organist and composer Anton Bruckner (1824-1896) wrote long, often massive symphonies. His musical output came in the middle of the nineteenth century, a little after Beethoven's time and overlapping early Mahler. We see Bruckner building on the longer works of Beethoven, especially the Ninth Symphony, and the more epic proportions of Wagner. Later, we would see Mahler adopting some of Bruckner's lengthier concepts. And there's another part of the equation: Beyond hewing to the conventional four-movement structures of the eighteenth and nineteenth centuries, Bruckner ventured into new harmonic, even dissonant styles. There are times when the listener must sit and wait almost in vain for a major thematic element to present itself, and then wait even longer for Bruckner to develop it. Nevertheless, when performed by the right people, Bruckner's music can be quite satisfying, reaching heights of spiritual ecstasy seldom attempted by other composers. Among the conductors who have brought me a personal measure of joy with their Bruckner recordings are Eugen Jochum, Otto Klemperer, Herbert von Karajan, Karl Bohm, Bruno Walter, Gunter Wand, Herbert Blomstedt, Bernard Haitink, and Sir Roger Norrington, among others. Enter Lance Friedel. The first and only other time I had heard a recording by Maestro Friedel was on an album entitled Great Comedy Overtures, which I quite liked. While Friedel might not have been facing such demanding material in the overtures as he is on the present disc, he invested a good deal of enthusiasm in the project and offered up a frothy collection of lightweight tunes. Here, Maestro Friedel tackles the formidable Symphony No. 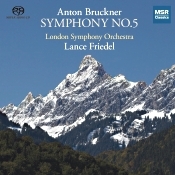 5, which Bruckner wrote between 1875 and 1876, but which he never heard performed in his lifetime by an orchestra. (A non-authenticated version premiered in 1894, but Bruckner was too ill to attend.) The work didn't even get a complete commercial recording until 1937, when Karl Bohm did it with the Dresden Staatskapelle. All of this may seem surprising when you consider that the Fifth followed upon the success of his Fourth Symphony, but it's possible the composer never felt satisfied with the Fifth, leaving it uncompleted at his death. Various musical scholars edited it later, with Maestro Friedel using the version by Leopold Nowak from 1951. As time went on, people came to know the piece as the "Tragic," "Church of Faith," or the "Pizzicato" symphony. Anyway, the work begins with a very slow, very soft introduction, so soft that on the present recording you may wonder when it's ever going to begin. But the slow pizzicato strings soon give way to an abrupt eruption fortissimo and then on through a series of harmonious passages to a heady Allegro, all of which Friedel handles smoothly, gracefully, and without undue fuss. In fact, this is among the more-lyrical interpretations you'll find, even though Friedel retains the music's stately, august outlines and ends the segment most nobly. What's more, the London Symphony is up to its usual high standards, even if they don't quite sound as lush or rich as the Berlin Philharmonic under Karajan. Next, we have an Adagio: Sehr langsam, or a slow movement Bruckner expects the performers to take "very slowly," indeed. Interestingly, Bruckner uses the same basic themes for both the slow movement and the third-movement Scherzo, as well as alternating themes throughout the movement, and the juxtapositions make a fascinating experience, particularly as Friedel manages them. The following Scherzo itself moves along at a steadily contrasting pace under his direction, the tempos continually changing but effortlessly so. I have no doubt this section of the symphony must have inspired something in Mahler. Like the first movement, Bruckner's finale begins slowly and softly, again with pizzicato strings soon permitting a moderate Allegro to develop. This has always been my favorite part of the symphony, and Maestro Friedel does it justice. While it dances and sparkles under Friedel's guidance on the one hand, it retains its regal grandeur throughout. Even though the Fifth is a long symphony (Bruckner's second longest), Friedel's brisk but pleasurable handling of things brings it in at a little over seventy-three minutes, one of the quickest I've heard. Yet it never sounds particularly rushed or hurried. Although it may not convey all the spacious majesty of Klemperer's interpretation; the burnished glow of Karajan's realization; the mystery and atmosphere of Walter's, Wand's, or Blomstedt's versions; or the clean, direct lines of Haitink's reading, there is a fine sense of urgency about Friedel's account, captured in cogent, insistent, well-controlled rhythms and dynamics. It is definitely a disc I'll be returning to from time to time and one well worth a Bruckner fan's consideration. Producer Tim Handley and engineer Phil Rowlands recorded the album at All Hallows Church, Gospel Oak, London in January 2014. They engineered it for hybrid SACD/CD playback, so one can listen to it in two-channel stereo or multichannel using an SACD player or two-channel stereo using a regular CD player. I listened in the SACD 2-channel mode. My only quibble with the sound is minor: it's that occasionally it can appear a touch hard or edgy in the upper midrange. That said, it's mostly exemplary, with good detail, just the right amount of lower midrange warm, a decent but not over-pronounced stereo spread, a sweet hall ambience, a fine depth of image, respectably strong impact, and a healthy degree of overall transparency. It's among the better-recorded Bruckner Fifths I've heard. July 19-30: Music, Wine, Beaches and Trails. It's easier than ever to get to SLO. Located halfway between Los Angeles and San Francisco on the Central Coast of California, beautiful San Luis Obispo County is now also accessible with two new direct flights: fly to/from Denver and Seattle nonstop. The SLO Airport also connects with LAX, SFO and Phoenix. You can also take a classic California roadtrip to get here. Join us. Enjoy the journey and relax with us once you reach your destination. The music is waiting. 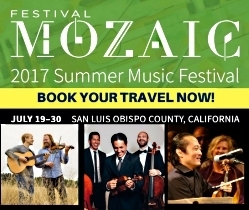 Join us in SLO for the opening weekend of the 2017 Festival, July 21-23, 2017. Attend the closing weekend of the 2017 Festival, July 28-30. Cal Performances at UC Berkeley welcomes the Asian Youth Orchestra with guest soloist, violinist Sarah Chang to Zellerbach Hall on Saturday, August 5 at 8pm. Asia's premier pre-professional orchestra, the ensemble features 107 young musicians from mainland China, Hong Kong, Taiwan, Indonesia, Japan, Korea, Macau, Malaysia, the Philippines, Singapore, Thailand, and Vietnam, who convene during the summer for a demanding schedule of rehearsals and international touring. Co-founder and artistic director Richard Pontzious conducts the orchestra for Beethoven's Seventh Symphony, R. Strauss's Don Juan, and Sibelius's Violin Concerto. Beethoven's finely wrought and exuberant Seventh Symphony premiered in 1813 during a fertile creative period for the composer. The inventive orchestrations in Don Juan, Strauss' technically demanding orchestral tone poem, launched the composer's career after its premiere in 1889. Sibelius's lyrical and virtuosic Violin Concerto (1904, revised 1905), his only concerto, has become of the most popular violin concertos composed in the 20th century. Tickets for the Asian Youth Orchestra with Sarah Chang on Saturday, August 5 at 8pm in Zellerbach Hall range from $36–86 and are subject to change. Half-price tickets are available for UC Berkeley students. Tickets are available through the Ticket Office at Zellerbach Hall, at (510) 642-9988, at calperformances.org, and at the door. For more information about discounts, go to calperformances.org/discounts. Bang on a Can continues its 30th anniversary landmark season with a performance by the Bang on a Can All-Stars and Chinese superstar singer Gong Linna presented by Lincoln Center Festival on July 14 and 15, 2017 at 8pm at Gerald W. Lynch Theater at John Jay College (524 W. 59th St.). A spectacular journey into Chinese myths and ancient poetry, Cloud River Mountain combines the stories of the past with the sounds of the future. In a rare U.S. appearance, Gong Linna joins the Bang on a Can All-Stars in a brilliantly staged concert of new music composed by Gong Linna's musical partner, composer Lao Luo, and Bang on a Can co-artistic directors Michael Gordon, David Lang, and Julia Wolfe. Gong Linna and the All-Stars' recording of Cloud River Mountain on Cantaloupe Music will be available for purchase at the performances in advance of the album's worldwide release date of July 21, 2017. Now in its 30th year, Bang on a Can is committed more than ever to an increasing and inclusive world-wide community dedicated to innovation through music; a world where ideas flow freely across boundaries; musical, geographical, spiritual. Co-founders Michael Gordon, David Lang, and Julia Wolfe explain, "Thirty years ago we started dreaming of the world we wanted to live in. It would be a kind of utopia for music: all the boundaries between composers would come down, all the boundaries between genres would come down, all the boundaries between musicians and audience would come down. Then we started trying to build it. Building a utopia is a political act – it pushes people to change. It is also an act of resistance to the things that keep us apart." National Endowment for the Arts Chairman, Jane Chu, has approved more than $82 million to fund local arts projects across the country in the NEA's second major funding announcement for fiscal year 2017. The NEA received 1,728 Art Works applications and will make 1,029 grants, including an Art Works award of $15,000 to American Bach Soloists to support the 2017 ABS Festival & Academy. "The arts reflect the vision, energy, and talent of America's artists and arts organizations," said NEA Chairman Jane Chu. "The National Endowment for the Arts is proud to support organizations such as American Bach Soloists, in serving their communities by providing excellent and accessible arts experiences." The public events of the 2017 American Bach Soloists Festival & Academy will be held August 4 through August 13 in the San Francisco Conservatory of Music and St Mark's Lutheran Church (S.F.). For more information visit sfbachfestival.org or americanbach.org. Scott Yoo leads the Festival Orchestra in a program celebrating baroque masterpieces at the enchanting setting of Serra Chapel (formerly Chapel Hill), a private chapel built from historical artifacts from the Hearst Collection. The grounds open at 6 p.m. for picnicking and enjoying the beautiful views at this remote, one-of-a-kind location before you relax into an evening of resplendent music. On Wednesday, July 19 at 8 PM, the world-renowned Emerson String Quartet joins a cast of seven actors, including actors David Strathairn (Temple Grandin, The Bourne Ultimatum) and Jay O. Sanders (The Day After Tomorrow, Green Lantern), for the new theatrical production Shostakovich and The Black Monk: A Russian Fantasy at the Seiji Ozawa Hall at the Tanglewood Music Festival. Co-commissioned by Tanglewood Music Festival, the Great Lakes Chamber Music Festival and Princeton University Concerts, Shostakovich and The Black Monk: A Russian Fantasy received its world premiere at the Great Lakes Chamber Music Festival on June 17, 2017. Written and directed with great imagination and wit by James Glossman, this production is a timely and interesting discourse concerning the suppressive influence on culture in Stalin's Russia. A fantasy based on Shostakovich's 50-year obsession with creating an opera from Anton Chekhov's short story "The Black Monk," this play portraits the composer's life-long struggle for freedom and sanity against his own demons. Described by James Glossman as a "Valentine to the human spirit," it incorporates a vivid sarcastic edge to the oppressive Russian society that inspired many of Shostakovich's compositions. -- Xi Wang, Kirshbaum Associates Inc.
National Endowment for the Arts Chairman Jane Chu has approved more than $82 million to fund local arts projects across the country in the NEA's second major funding announcement for fiscal year 2017. Included in this announcement is an Art Works award of $40,000 to Orpheus Chamber Orchestra to launch a 2018 nationwide tour, further their education and community initiatives, and introduce the new Orpheus Music Academy training program. The NEA received 1,728 Art Works applications and will make 1,029 grants ranging from $10,000 to $100,000. "We are thrilled and honored to be awarded this funding," said Orpheus Executive Director Alexander Scheirle. "We are grateful to the NEA for their longstanding recognition of the orchestra's artistry, and look very much forward to sharing the joy of music-making with communities across America." The Los Angeles Master Chorale will be inducted into the American Classical Music Hall of Fame on Thursday night during its Lux Aeterna 20th Anniversary celebration concert. This honor will be accepted by Artistic Director Grant Gershon and President & CEO Jean Davidson on behalf of the Master Chorale from the stage of their iconic home, the Walt Disney Concert Hall. It joins previous esteemed inductees in the ensembles category such as the Boston Symphony Orchestra, the Cleveland Orchestra, Chicago Symphony Orchestra, New York Philharmonic, Mormon Tabernacle Choir, and Handel and Haydn Society. The American Classical Music Hall of Fame (ACMHF) was founded in 1996 and is based in Cincinnati. It seeks to build and sustain enthusiasm for classical music in America by celebrating diverse facets of classical music excellence. Over 100 ensembles and individual musicians and composers have been inducted. The Los Angeles Master Chorale was selected by the Board of Directors earlier this month in recognition of its contributions to classical music. In celebration of LGBTQ Pride Month, AOP is making available to the public the video of its 2014 World Premiere production of the opera As One, streaming from June 23-30, 2017 on the AOP website. As One, with music and concept by Laura Kaminsky, an original libretto by Mark Campbell and Kimberly Reed, and film by Ms. Reed chronicles the experiences of a transgender person with empathy and wit as she emerges into harmony with the world around her. Mozart's Idomeneo Comes to "Great Performances at the Met"
Music Director Emeritus James Levine conducts an extraordinary ensemble in Idomeneo, Mozart's early masterpiece of love and vengeance following the Trojan War on "Great Performances at the Met" Sunday, July 16 at 12 p.m. on PBS. Tenor Matthew Polenzani sings the title role of the King of Crete, with mezzo-soprano Alice Coote in the trouser role of his noble son Idamante, soprano Elza van den Heever as Elettra, and soprano Nadine Sierra as Ilia. 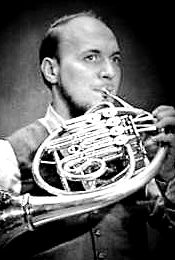 Albert Linder, horn; Hans Swarowsky, Vienna State Opera Orchestra. Vanguard/Amadeus AMD 7012. Can we really have too many recordings of Mozart's four horn concerti? Probably not, at least not when musicians play them so well as they do here. I must admit I fell in love with these sweet, leisurely renditions from Albert Linder the first time I heard them, which was some years after he recorded them in 1961 with the Vienna State Opera Orchestra. Of course, nothing has yet to top Dennis Brain's performances from a little more than a half dozen years earlier, but Brain's recording is in monaural, and I can understand people today wanting only stereo. This one seems to me as good as any. The agenda begins with No. 3, the most poetically lyrical of the lot. It is also the most profound and, in its way, perhaps the most mature. Certainly, it is the most complex. I suppose the album producer chose it to lead off the program because it demonstrates Linder's relaxed, conservative style better than the others. Not that Linder's pace sounds slow; it just sounds right. Even the closing Allegro, normally a robust hunting motif, sounds easygoing in Linder's hands. No. 4 follows, also in the restful style of an earlier age. These interpretations are in marked contrast to many more modern ones that go at the music with wildly unrestrained tempos. The program continues in reverse order with No. 2 second to last and No. 1 bringing up the rear. There is no particular reason why one needs to place the First Horn Concerto first; Mozart wrote the concertos several years apart and probably never expected orchestras to play them in sequence, if, indeed, anyone played them all together in the first place. Anyway, No. 1 is the simplest, most straightforward of the bunch, and in many ways the most charming. In spite of Linder's seemingly languid pace, it, too, comes off effortlessly. The entire enterprise has a most appealing attitude of repose about it that can draw one in whether one likes it or not. The disc is in Vanguard's Amadeus line, meaning it was a favorite recording of its producer (and Vanguard co-founder), Seymour Solomon. The high-definition 24-bit transfer makes the audio appear much newer than it is, the orchestra sounding clean and fresh, if a little bright and hard, the horn sounding even more round and dulcet than usual by comparison. There is almost no background noise to intrude on the proceedings. Overall, this is an issue that every Mozart fan might want to investigate. Also, Till Eulenspiegel. 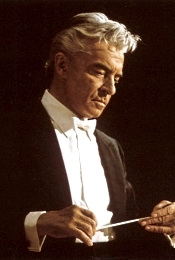 Herbert von Karajan, Vienna Philharmonic Orchestra. HDTT remastered. No, you're not experiencing deja vu. It was only a few weeks before writing this HDTT review of Herbert von Karajan's 1959 Zarathustra recording that I posted a review of Decca's own remastering of the classic. So, it was informative for me to compare the two versions: Decca's "Legends" release from 2000, supposedly using the original master tape, and the newer release from HDTT (High Definition Tape Transfers), transferred from a 2-track 15-ips tape. But first, a note about the recording, which is, indeed, a classic. German composer Richard Strauss wrote his lengthy tone poem Also sprach Zarathustra in 1896, inspired by philosopher Friedrich Nietzsche's novel. But it was probably director Stanley Kubrick's 2001: A Space Odyssey that really made it famous more than anything else. Well, at least it made the Prelude famous, which Kubrick employed several times in the film. It gained instant recognition, and it was Karajan's '59 recording that Kubrick used. In fact, the tone poem became so famous thanks to Kubrick that a joke arose about how you can always tell an audiophile because he only plays the Zarathustra Prelude. Anyway, the performance is pure Karajan: grand, imposing, sensual, romantic, luxuriant, with the playing of Vienna Philharmonic always full and rich. Of course, everyone has personal preferences, and of the conductor's three stereo versions of Zarathustra, the second (DG) seems to me more luminous than this earlier one, if not, as I say, better known. Anyway, this is the one most people probably know, so it's good enough reason to find it remastered again. "The end music credits do not list a conductor and orchestra for Also Sprach Zarathustra. Stanley Kubrick wanted the Herbert von Karajan/Vienna Philharmonic version on English Decca for the film's soundtrack, but Decca executives did not want their recording 'cheapened' by association with the movie, and so gave permission on the condition that the conductor and orchestra were not named. After the movie's successful release, Decca tried to rectify its blunder by rereleasing the recording with an 'As Heard in 2001' flag printed on the album cover. In the meantime, MGM released the 'official soundtrack' LP with Karl Bohm's Berlin Philharmonic Also Sprach Zarathustra discreetly substituting for von Karajan's version." John Culshaw and engineer James Brown made the Zarathustra recording in the Sofiensaal, Vienna. They framed the sound as carefully as always, Culshaw making the Karajan disc just after he had done the same for Georg Solti's Wagner Ring cycle. The producer brought the same meticulous expertise to the production as always, creating an expansive sonic picture that for quite a while remained an audiophile demo piece. While I had always found the sound a bit hard in its vinyl and early CD forms, Decca's 2000 "Legends" remaster came off more comfortably than before. The sound was smoother and slightly warmer, with a little softer an image, yet one that contrasted more than ever with its discernibly rough, noisy background. I still did not find it entirely satisfactory in another way, too, because it seemed to lack the life and dynamism I remembered from the earlier vinyl and CD editions. Now, the folks at HDTT have remastered it (2017), and we have something much closer to my recollection of the original LP. In the HDTT product we find most of my objections to the Decca remastering largely improved. The HDTT aural picture is not quite so smooth as Decca's, but it sounds wider, deeper, and more detailed, with even greater dynamic impact. What's more, it appears quieter, too. In short, if you prefer Karajan's 1959 version of the music to those by Reiner, Haitink, Mehta, Kempe, and others, this HDTT transfer is no doubt the best you'll find it on compact disc. Decca included several couplings on their "Legends" disc, but HDTT include only Till Eulenspiegel's Merry Pranks. Producer Erik Smith and engineer James Brown recorded it a year after Zarathustra with the same orchestra and location. 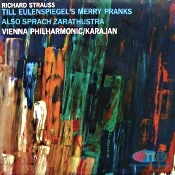 Karajan and the VPO have fun with the merry prankster, and the sound is much the same as the recording of the year before: full, wide, dynamic, and detailed. 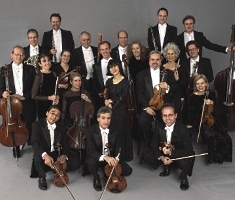 Orpheus Chamber Orchestra is featured in a free outdoor concert at Central Park's historic Naumburg Bandshell on Tuesday, July 18 at 7:30 p.m., presented by Naumburg Orchestral Concerts and hosted by WQXR's Annie Bergen. The orchestra performs J.S. Bach's Brandenburg Concertos Nos. 2, 3, 5, and 6. Showcasing the many aspects of the Baroque concerto form, these staple of the Orpheus repertoire exude a spirit of cheerfulness and joy. Also on the program is Christopher Theofanidis' Muse which was commissioned and premiered by Orpheus in 2007 as part of its New Brandenburgs project, and inspired by Bach's Brandenburg Concerto No. 3. Following the Central Park concert, on Thursday, July 20 at 7:30 p.m., Orpheus travels to Winona, Minnesota to perform the same four Brandenburg Concertos (Nos. 2, 3, 5 and 6) as part of the Minnesota Beethoven Festival at Winona State University. Orpheus Chamber Orchestra is also pleased to announce that violinist Miho Saegusa has been added to its musician roster. Saegusa, who enjoys a multifaceted career as a versatile chamber musician, orchestral leader, and soloist, has performed and toured with Orpheus Chamber Orchestra previously. Tickets are not required for the July 18 concert in Central Park; it is free and open to the public. More information at naumburgconcerts.org. Tickets for the July 20 concert in Minnesota are $25 for adults and $21 for students and seniors, and can be purchased at the Saint Mary's University Performance Center Box Office (700 Terrace Heights), by calling 507-457-1715 (weekdays from 12:00 p.m. to 6:00 p.m.), or by visiting the Minnesota Beethoven Festival Web site, mnbeethovenfestival.org. French conductor Louis Frémaux, principal conductor of the City of Birmingham Symphony Orchestra (CBSO) from 1969 to 1978 and the Sydney Symphony Orchestra from 1979 to 1981, has died aged 95. Fremaux (1921-2017), whose performances UK music critic Noel Goodwin described as "frequently distinguished by freshness, suppleness and, in the French repertory, an airy brilliance," led the Sydney Orchestra in the years before Charles Mackerras took over as Chief. SSO Principal Trombone Ronald Prussing, who was hired during Fremaux's tenure, shared his memories of the conductor with Limelight: "I distinctly recall how elegant he was as a conductor on the podium," Prussing said. "He was very French. He wasn't boisterous but he was quite clear." "He was very, very good at the French repertoire, particularly things like the Organ Symphony of Saint-Saëns – the Bizet Symphony in C he was very good at," he said. "And a little bit of English music, too – he did a very, very good Walton Symphony No 1, which was really quite stunning. 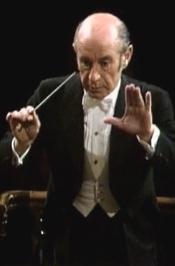 I think he did that as a guest and on that basis was considered for Chief Conductor." Fort Worth Opera (FWOpera) announced the launch of FWOpera Foreward, a million dollar, summer-long campaign designed to invite the community-at-large and artists from across the United States to share their inspirational stories, experiences, and passion for the arts, especially their fondest memories of the opera company itself – an institution that has enriched the city of Fort Worth for over 70 years. These stories will be shared on FWOpera's social media platforms and official website as a celebration of the impact and importance of arts and culture on those who call Fort Worth home. The campaign's title was purposefully chosen, as each great story begins with a preface, or foreword, that sets the stage for the narrative ahead. As one chapter is closed, another begins anew, starting life as a blank canvas of limitless possibility. FWOpera, energized by the positive community-wide response to its 2017 Festival and the smash-hit mariachi opera Cruzar la Cara de la Luna, now pays homage to its rich, 71-year legacy and the incredible city from which it arose, charting a course towards a brighter and more sustainable tomorrow. FWOpera Foreword is initiated by a combined $250,000 lead gift from two long-time FWOpera supporters, in honor of the company's 11th Festival season and its steadfast commitment to pioneering the new frontiers of artistic expression. This pivotal campaign, which kicks off in June and lasts until the end of August, will offer everyone an opportunity to share their stories with the community, as we honor the history and heritage of Cowtown, and relive the legends that brought it to international prominence. FWOpera calls upon opera lovers and valued citizens of this cultural community to consider a gift that will secure the legacy of the oldest opera company in the state of Texas. Everyone who participates will pen a part of FWOpera's own libretto, to ensure a successful 2018 season and beyond. To make your mark on Fort Worth Opera's new story and join in writing the next great chapter of the company's future, donate today by calling 817.288.1212 or go online at www.fwforeword.org. In high demand by both audiences and presenters throughout the classical music domain for their uncommonly unified sound and extraordinary musical versatility, the Danish String Quartet returns to the United States in summer 2017 for an eight-concert tour across five cities. Since their debut in 2002 at the Copenhagen Festival, the group of musical friends continues to manifest their passion for Scandinavian composers by frequently incorporating Nordic repertoire into adventurous contemporary programs, while invariably proving to be intelligent and profound performers of the classical masters. This summer the Quartet brings exciting and diverse programming, featuring works by Bartók, Beethoven, Brahms, Haydn, Schubert, Shostakovich, and Nordic folk music, with collaborations that include "the delightfully unassuming but bewitching" (The Guardian) Finnish pianist Juho Pohjonen and rising star Swedish cellist Jakob Koranyi. On August 10, the Quartet closes their broad tour at the Mostly Mozart Festival with two concerts in one evening: a 7:30pm performance of Beethoven string quartets, and a 10pm late-night concert of Scandinavian folk tunes. Ravinia announces that pianist Denis Matsuev greatly regrets that under his doctor's orders he must reduce his schedule due to exhaustion and therefore must withdraw from his concerto appearance at Ravinia on Aug. 1 with the Chicago Symphony Orchestra. Simon Trpceski—who will perform Tchaikovsky's First Piano Concerto with the CSO as part of Ravinia's annual "Tchaikovsky Spectacular" on July 16—will replace Matsuev in a performance of Rachmaninoff's Rhapsody on a Theme of Paganini as programmed for the Aug. 1 concert of classic favorites. Trpceski has recorded the Rhapsody on a Theme of Paganini both with the BBC Symphony Orchestra and the Royal Liverpool Philharmonic Orchestra with conductor Vasily Petrenko as part of their highly acclaimed complete recordings of the Rachmaninoff concertos. He recently performed the piece with the Los Angeles Philharmonic, winning raves from the Los Angeles Times. Mr. Matsuev looks forward to returning to Ravinia in a future season. James Dane Harvey has been appointed as the Salisbury Symphony Orchestra's (SSO) new Executive Director, taking over from Linda Jones who retires after 14 years in the role. Harvey started his new role on June 1st, joining the SSO team which includes David Hagy (Music Director), Dr. Lynn Bowes (Education Director), Ms. Jordan Warren (Assistant to the Executive Director), and Mr. Hunter Safrit (Administrative Assistant). Harvey, a Rowan County native, has spent his entire academic and professional career involved in the performing arts. He lived in London for over 10 years during which time he was responsible for public relations and marketing campaigns for high-profile artists, entertainment organizations and numerous West End musicals. He also served as Managing Director of Yale Opera at Yale University and as Production Coordinator for Central City Opera, a summer opera festival in Colorado. 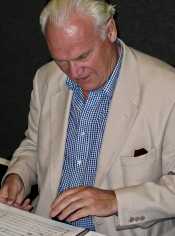 Harvey holds a High School Diploma and Bachelor of Music Degree from the University of North Carolina School of the Arts, a Master of Arts degree in Cultural Policy and Arts Administration from Goldsmiths College, University of London, and a Master of Philosophy degree in Arts, Culture and Education from the University of Cambridge, where his research thesis focused on the popularization of classical music. On the appointment of Harvey, Music Director David Hagy says, "I've known Dane since he was a teenager performing with the Piedmont Players. The thing I remember most about him was his passion for music and theatre. Although he is a bit older than when we first knew each other, his passion is undiminished. In fact I'd say he's more energized about music, specifically wanting to engage the broadest possible audience with this art form. I look forward to working with him again." The SSO's 51st season commences on July 1st, and includes a program of four performances by the orchestra featuring works by Bach, Brahms, Beethoven, Dvorak, and Darrell Harwood (hence the theme "Pushing The Envelope"!). Call the Symphony office at 704-637-4314 for a copy of the Season Brochure. Find the Salisbury Symphony on Facebook, Twitter and Instagram. Tickets and information can be found online at www.salisburysymphony.org. Italian pianist Luca Buratto, the Honens International Piano Competition's 2015 Prize Laureate, will make his New York debut at Zankel Hall at Carnegie Hall on Wednesday, October 11, 2017, at 7:30 p.m. His program features works by Adès, Janácek, Ligeti, Prokofiev and Schumann. The concert is presented by the Honens International Piano Competition. Luca Buratto stated, "My program for Carnegie Hall juxtaposes five very different types of works—all great, each having its own perspective and expressiveness: the struggles depicted in the sonatas by Janácek and Prokofiev; music of phantoms, angels and hidden voices in the works by Adès and Ligeti; and the distinctive voice of Schumann in his Humoreske. The music of Schumann has, in fact, become almost an obsession with me. Schumann was a tender poet and a stormy romanticist; his work—passionate, intense, lyrical and revolutionary—heralded a new conception of what music could be. Performing and recording his music is always challenging and inspiring, intensely gratifying—a compelling journey into the mind and the art of my most beloved composer. I will be happy and grateful to share the works of all these composers in Zankel Hall." Luca Buratto was among ten pianists from seven countries, aged 20 to 30, who performed in the Semifinals of the 2015 Honens International Piano Competition. After advancing to the Finals, he was named Honens Prize Laureate, receiving a cash award of $100,000 (CAN) and an artistic and career development program valued at a half million dollars. Tickets: $35, $25, $15 ($10 students and seniors, at Box Office only), available July 13, 2017, at carnegiehall.org; by calling CarnegieCharge (212) 247-7800; or by visiting the Carnegie Hall Box Office: 57th Street and Seventh Avenue, NYC. One of the classical world's most sought-after artists, the legendary violinist Itzhak Perlman, will headline Ravinia's July 29 Gala, joining conductor Christoph Eschenbach and the Chicago Symphony Orchestra. Hosted by Ravinia's Women's Board, the Gala supports the not-for-profit festival and its REACH*TEACH*PLAY education programs, which serve 85,000 people in Cook and Lake Counties. Due to continued physical therapy prompted by inflammation in his left arm, the originally scheduled soloist, pianist Lang Lang, has been forced to cancel his concert appearances through the end of the summer. He extends his apologies and looks forward to making music again soon. Ravinia wishes him well. "Ravinia lives under a lucky star, indeed, that a performer of this magnitude would step up in this way, and we owe this extremely rare assist to Mr. Perlman's unwavering commitment to children and music education, along with his steadfast appreciation of Ravinia, the CSO and Maestro Eschenbach. We cannot thank him enough," said Ravinia President and CEO Welz Kauffman. "Itzhak joins the entire Ravinia Family in wishing one of our own, Lang Lang, a complete and speedy recovery along with an open invitation." The acclaimed Merola Opera Program, one of the most prestigious and selective opera training programs in the United States, continues its 2017 Summer Festival during its 60th Anniversary season with a triple bill of fully-staged, one-act operas, Pergolesi's La serva padrona, Holst's Savitri, and Walton's The Bear, on Thursday, July 20 at 7:30 pm and Saturday, July 22 at 2 pm at the San Francisco Conservatory of Music (50 Oak Street, San Francisco). This production is conducted by Christopher Ocasek and directed by Peter Kazaras. Tickets for the performances range from $50 to $70, with a limited number of $15 student tickets available. Tickets are $50 and $70, in addition to a student price of $15*. Tickets may be purchased by calling the San Francisco Opera Box Office at (415) 864-3330 or by visiting merola.org or www.sfopera.com. The box office is open Monday, 10 am to 5 pm, and Tuesday through Friday, 10 am to 6 pm. *Student tickets must be purchased in person at the Box Office window, located inside the War Memorial Opera House at 301 Van Ness Ave. Valid student ID is required. For completre information, visit merola.org or sfopera.com. California Symphony has been awarded a $15,000 Art Works grant from the National Endowment for the Arts (NEA), its first grant from the agency since 2011, in recognition and support of its Sound Minds elementary school music program in San Pablo, CA. The Orchestra also announced that the California Arts Council has renewed and increased its support of the Sound Minds program, with a grant of $16,200. It is the first-ever NEA grant for Sound Minds, which is modeled on Venezuela's El Sistema program, and both awards acknowledge the powerful difference Sound Minds is making in the lives of young students and families at Downer Elementary School. Kids in the Sound Minds program, now in its sixth year at Downer Elementary, have outscored their peers in standardized tests by as much as 63%, with the achievement gap widening each year students participate. When second graders begin the program, baseline data shows students enrolled in Sound Minds, and those who are not in the program, test equally proficient in math and reading (equal numbers in each percentile) per standardized test scores. However, after one year in program, math proficiency rates quadruple -- four times as many students test at grade level or higher, compared to the 3rd graders not in the program -- and reading proficiency rates for this majority Spanish-speaking population double, compared to their non-participating peers. Cadenza Artists is proud to announce our newest roster addition, pianist Lara Downes. Recognized as an iconoclastic pianist whose artistry has been called "luscious, moody and dreamy" by the The New York Times and "ravishing" by Fanfare Magazine, Lara Downes takes inspiration where she finds it, going beyond labels like "classical" or "eclectic" to make music that is timeless and timely, starts conversations, and resonates with the world we live in. Lara Downes is a recipient of the 2017 Innovator of the Year Award by University of California, Davis. The Award recognizes Lara's acclaimed album America Again, inspired by Langston Hughes' 1935 poem, "Let America Be America Again," which debuted in the top 10 on the Billboard Classical charts and was picked by NPR as one of "10 Classical Albums that Saved 2016." America Again is in many ways the coming-of-age memoir of an artist who has found her own way and carved her own path through American music to express the diversity of American history and American dreams. Saturday, June 24, 2017 - 1 PM. Grand Park, downtown Los Angeles. Free event. Join a gigantic chorus of singers for the Los Angeles Master Chorale's inaugural group sing, "Big Sing L.A.!" In addition to a performance by the Los Angeles Master Chorale, you get to sing and harmonize some of your favorite songs with our singers. You'll also get to meet and learn about many other choirs that perform right here in Los Angeles. Everyone, regardless of singing ability, is encouraged to participate. Complimentary water provided, courtesy of Coca Cola. Free tote bags will be given to the first 1,000 attendees. Francisco Nunez, Artistic Director, Young People's Chorus of NYC; Rollo Dilworth, Director of Choral Music, Temple University; Eric Whitacre, Artist-In-Residence, Los Angeles Master Chorale; and Moira Smiley, Composer/Singer, VOCO Ensemble. William Skeen, cellist with the Philharmonia Baroque Orchestra writes: "I've been playing the cello with Philharmonia for 14 years and have loved every moment of it. Each season I look forward to Nic's imaginative programs, working with the very best colleagues, and chatting with such enlightened supporters. But it's working with kids - both my own son and daughter who are budding classical musicians and the students who take part in PBO's music education programs - that keeps me grounded and hopeful. In Bay Area middle and high schools to PBO's new partnership with The Juilliard School's historical performance program, it's all about raising up the next generation of musicians and audiences. Would you please help support the next generation of musicians? I did not have the luxury of a baroque cello teacher or coach early in my career. All of my training came from direct contact with players, many of whom are in the Philharmonia family. I know you share my passion for historically-informed perormance practice and it's fantastic to see how many young people are taking up period instruments." Also, "The Tale the Pine-Trees Knew." David Lloyd-Jones, Royal Scottish National Orchestra. Naxos 8.554509. I used to have a favorite recording of the Bax Fifth Symphony in the old LP days, one by Raymond Leppard on Lyrita as I recall, long since gone, a casualty of the CD era. It's been some time since I last heard the work, and, frankly, I didn't remember much of it after thirty-odd years. But I knew after listening to David Lloyd-Jones's rendition on this modestly priced Naxos issue that I still like it, especially in its newer and more dramatic aural setting. Arnold Bax (1883-1953) was a contemporary of Vaughan Williams, and the public considered both men natural successors to Edward Elgar as deans of twentieth-century British music. Bax took an early liking to the poetry of W.B. Yeats and Celtic mythology, and much of Bax's music reflects the imagery and atmosphere of Celtic legend. However, his Fifth Symphony, often considered the best (and, surely, the most popular) of the seven symphonies he completed, is a little different in that he said his biggest influence was the Nordic moods of Sibelius. Bax premiered the Fifth in 1934 under the baton of one of Sibelius's champions, Sir Thomas Beecham, but David Lloyd-Jones does an admirably fine job bringing out the music's color as well. Sibelius or no, I continue to hear more of the craggy ruggedness and brooding echoes of Tintagel and the coast of Cornwall in the piece than any specific Norse themes. Bax wrote the symphony in three movements rather than four, and none of the movements is particularly poetic or lyrical. The work starts on a typically mysterious note--a soft, pulsing beat that builds into shattering waves and then walls of sound. The whole work has a power and scope that remind one of the aptly chosen cover picture of the Scottish highlands. Or the Cornish coast. Fanfares and glimmering violins continue the second movement, which turns more solemn as it goes along. The finale moves along with a strong forward impulse and ends in a grand burst of orchestral color. It's all very dramatic and intense under Lloyd-Jones's direction and a workout for one's audio system. 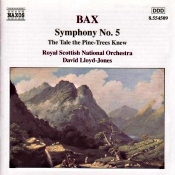 Coupled with the Fifth is one of Bax's many tone poems, a sixteen-minute composition with the inconvenient title, "The Tale the Pine-Trees Knew." Inconvenient because it tends to make the piece seem like a children's story, which it most pointedly is not. It is, in fact, a miniature of the Fifth Symphony, with the same kind of craggy rhythms, rugged harmonies, and moody reflections. Done up as sympathetically as it is by Maestro Lloyd-Jones, whose Scottish forces must have this music in their blood, the entire album is hard to resist. Then there's Naxos's sound, which is equally big and dramatic, with plenty of weight, and you get more than a measure of your money's worth. If you like the music of Bax, this disc is well worth considering. Piano Concertos Nos. 21 & 23. Simone Dinnerstein, piano; Jose Antonio Mendez Padron, Havana Lyceum Orchestra. Sony Classical 88985382442. 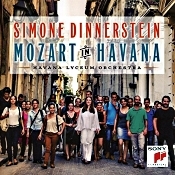 There are probably any number of reasons American classical pianist Simone Dinnerstein chose to record this album, Mozart in Havana. Certainly, she has a deep and abiding love of Mozart and probably welcomed any opportunity to record the man's music. In addition, with the thawing of political relations between the U.S. and Cuba, she no doubt saw the album as a chance to help the political situation regardless of whether Cuba remained a Communist state. Third, she had performed at a music festival in Havana a few years earlier and surely welcomed the occasion of playing there again. But maybe the main reason is that her first piano teacher, Solomon Mikowsky, was a Cuban Jew of Polish descent who had grown up in Havana and told her stories of Cuba's many musical influences there. I'm sure there are other reasons she made the record, but let it suffice that the album is here and we have it for our enjoyment. Ms. Dinnerstein (b. 1972) you likely already know. She burst onto the musical scene in 2007 with a well-received account of Bach's Goldberg Variations and has been going strong touring and recording ever since. Accompanying Ms. Dinnerstein on the present disc is conductor Jose Antonio Mendez Padron, the musical director of the Havana Lyceum Orchestra. Padron founded the ensemble in 2009, as the booklet note explains, "in collaboration with the Mozart Lyceum of Havana, "an institution co-sponsored by the Salzburg Mozarteum Foundation in Austria. It brings together students, recent graduates and professors from the University of the Arts, the National School of Music and the Amadeo Roldan Conservatory." Moreover, "the orchestra has quickly established itself as a central element of Cuba's musical life." The two Mozart concertos Ms. Dinnerstein chose to perform on the program are among the composer's most famous. He wrote the Piano Concerto No. 21 in C major, K. 467 in 1785, and the 1967 Swedish film Elvira Madigan probably did as much as anything to popularize it, making the second-movement Andante familiar to almost everyone. Ms. Dinnerstein plays the piece with a refined grace, yet with a considerable amount of verve and vitality, making everything sound just right, especially in the opening movement. If the second movement sounds a little quicker yet a little dreamier than usual, too, well, that's part of the pianist's style as well. She makes the music her own without distorting it in any way, and Maestro Padron and his Havana Lyceum Orchestra accompany her with a smooth, flowing elegance. Mozart completed the Piano Concerto No. 23 in A major, K. 488 in 1786. It is slightly more operatic in tone than No. 21, possibly because Mozart wrote it around the same time as The Marriage of Figaro. In any case, it has more surprises in it than does No. 21 yet remains as melodic as anything the man conceived. 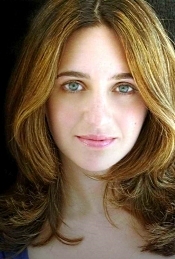 Although Ms. Dinnerstein adds her own dramatic touches, she remains above all sensitive and responsive in the music. The result is an energetic realization of the score, with a haunting and intriguing Adagio, followed by a joyful finale. These are lovely interpretations that should displease no one. More important, perhaps, they should absolutely delight those fans who already appreciate Ms. Dinnerstein's music making. Adam Abeshouse produced, engineered, mixed, and mastered the album, recording it at Oratorio San Filipe Neri, Havana, Cuba in June 2016. The first thing one notices about the sound is the hall ambience, with plenty of bloom around the instruments and a fair amount of resonance. However, it is not obtrusive but rather flattering to the music. The orchestra is modestly distant, the soloist perhaps a shade too close, the piano spreading out a little too much in from the other players. Detail and definition are on the soft side, while sounding natural and comfortable. Dynamics are also quite wide, providing an overall realistic listening experience. The Music Institute of Chicago presents its 29th annual Chicago Duo Piano Festival July 7–16. In addition to offering students coaching, lectures, master classes, and recitals, the Festival includes five public events at Nichols Concert Hall, 1490 Chicago Avenue, in Evanston, featuring guest duo the Park Sisters, Festival Founders/Directors Claire Aebersold and Ralph Neiweem, and Music Institute piano faculty, all performing duo piano repertoire. 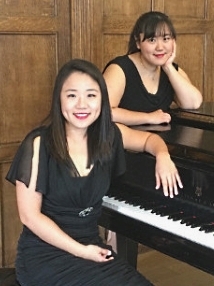 Gala Opening Concert: Duo Amadeae/the Park Sisters—Friday, July 7 at 7:30 p.m.
Esther and Sun-A Park won the Grand Prize and the Director's Prize at the 2016 Chicago International Duo Piano Competition, which included a field of 18 piano duos representing 14 countries. Their program includes Mozart's Two Piano Sonata in D Major, K. 448 and Liszt's Don Juan Fantasy. Esther Park has performed as a soloist with orchestras and in recitals across the United States as well as Asia and major European cities, including the Houston Symphony, Yale Philharmonia, Corpus Christi Symphony, Filharmonia Pomorska of Poland, Orchestra Filarmonica of Romania, Shanghai Philharmonic of China, Shreveport Symphony, the Juilliard Symphony, and the New Jersey Symphony. She gave a five-city recital tour in Korea and has performed at the Juilliard Theater in NYC, Alice Tully Hall, Lincoln Center, Carnegie Halls' Weill Recital Hall, Salle Cortot in Paris, the New Jersey Performing Arts Center, and Palau de la Musica in Spain and on the Kum-Ho Music Society's Prodigy Series. She was the winner of the 52nd Kosciusko International Competition and the Gina Bachauer Competition. Sun-A Park has received international recognition in several competitions, including 1st prize at the 61st Kosciuszko Foundation Chopin Competition (New York) and top prizes at the 58th Ferruccio Busoni International Piano Competition, the New York International Piano Competition, and the Gina Bachauer International Piano Competition. Her concerto engagements have included performances with the Houston Symphony Orchestra, San Marino Republic Orchestra, Haydn Orchestra, New Jersey Symphony, Albany Symphony, and the Symphonic Orchestra of Castilla y León. She has appeared at Alice Tully Hall and Benaroya Hall in the United States, National Dublin Hall in Ireland, Sejong Arts Center in Korea, the Miguel Delibes Cultural Center in Spain, and the Sendai Cultural Center in Japan. Free Master Class: Saturday, July 8 at 10 a.m. Guest duo the Park Sisters lead a master class. Duo Piano Dialogues—Sunday, July 9 at 3 p.m. Faculty Extravaganza Concert I—Tuesday, July 11 at 7:30 p.m. Faculty Extravaganza Concert II—Friday, July 14 at 7:30 p.m.
All concerts take place at Nichols Concert Hall, 1490 Chicago Ave., Evanston, Illinois. Except where noted, tickets are $30 for adults, $20 for seniors, and $10 for students and are available at 847-905-1500, ext. 108. Violinist Lara St. John will perform with Ensemble LPR on June 27, 7:30pm, as part of the 112th Naumburg Orchestral Concerts, a free concert series founded in 1905, held at the Naumburg Bandshell in Central Park, NYC. St. John will give the U.S. Premiere of a new string orchestra arrangement of Matthew Hindson's Maralinga (originally written for her), a haunting work that makes reference to the Aboriginal history at Maralinga, a place in the South Australian desert that was the site for secret British nuclear testing in the 1950s and 1960s. St. John will also perform Ralph Vaughan Williams' timeless work The Lark Ascending. The rest of the concert will feature an eclectic spectrum of music, with works by contemporary composer Jessie Montgomery, as well as Benjamin Britten, and Igor Stravinsky. The concert will be hosted by WQXR's Paul Cavalconte and broadcast live on Classical 105.9 WQXR and at www.wqxr.org. All concerts begin at 7:30pm and are presented at the Naumburg Bandshell on the Concert Ground in Central Park located south of the 72nd Street cross-drive. Admission is free on a first-come-first-served basis with some seating provided. No rain dates. For information, contact 212.501.7809 or log on to www.naumburgconcerts.org. Fifty years ago, HDSA was founded by Woody Guthrie's wife, Marjorie, shortly after Woody passed away from Huntington's disease (HD) complications when he was only 55 years old. HD is described as having ALS, Parkinson's and Alzheimer's – simultaneously. Children of a parent with HD have a 50/50 chance of inheriting this fatal brain disorder with no cure. HDSA looked to create a unique digital platform that celebrated the Guthrie Family legacy while getting the word out about this horrific disease that is devastating families. When the ALS Ice Bucket Challenge went viral, every nonprofit was being challenged to come up with an impactful campaign of their own. HDSA decided to stick to its roots and make music. In February 2015, the organization launched The Guthrie Sessions at HDSA, an online series that streams professionally edited music videos on HDSA's YouTube Channel. HDSA will book artists who are willing to volunteer their time to record five songs from HDSA's conference room in New York City or venues around New York City and Los Angeles. The songs are professionally shot and edited by filmmaker and photographer Rae Maxwell. Once the songs are completed, HDSA features the artist for an entire month, posting a new song each Monday. The artist will then share the videos to their fan base. In the end the artist receives professionally cut music videos and HDSA gets to introduce its mission to a new audience by sharing the Guthrie Family legacy…Win/Win for everyone, all for an incredible cause. Not only has The Guthrie Sessions at HDSA generated unprecedented awareness, it has also created a unique platform that has never been done before by a nonprofit organization battling a rare-disease. Fourth of July Fireworks Spectacular with Kathy Mattea and the Santa Rosa Symphony. The GMC's 3rd Annual Bluegrass Festival Featuring Del and Dawg Bluegrass Band, with Mark O'Connor and the O'Connor Family Band, and Sierra Hull. Gloria Estefan – The Standards & More, with Festival Napa Valley Music Academy Orchestra. Fort Worth Opera (FWOpera) announced today a call for submissions for its sixth annual Frontiers showcase, to be held during the 2018 Fort Worth Opera Festival – April 27, 2018 – May 13, 2018. Launched during the company's 2012-2013 season, Frontiers remains one of the only programs world-wide that seeks out unproduced works by the finest up-and-coming composers and librettists from North, South, and Central America, and has been acclaimed for the opportunities it provides its winners. Composers and librettists whose works are selected as part of the Frontiers showcase gain valuable exposure for their works in a live performance environment while also taking part in unparalleled networking opportunities with industry professionals including artistic directors of other established opera companies, artist managers, classical music publishers, funding organizations, and conductors. Composer and librettist teams whose works are selected for the 2018 Frontiers showcase will be in residence during the 2018 Festival where they will attend the showcase, participate in the final rehearsals of their work, and engage in discussions about their works with panelists and audience members. Selected composers and librettists will also receive feedback on their piece through private meetings with the Frontiers jury panel and will have a recording of their work provided to assist them further in their compositional process. Applications must be submitted between June 7 and July 31, 2017. Please contact Amanda Robie, Director of Artistic Operations at frontiers@fwopera.org for submission address and information. All application materials must be submitted electronically through the Frontiers web portal. Only 15-25 minutes of a composition will be considered. Submissions must include: Synopsis of the entire composition; Libretto and Piano/Vocal score of the excerpts (in order within the piece); English translation if the work is in another language. All materials submitted must have the composer and librettist names removed to ensure anonymity during the panel review. A non-refundable entry fee of $25 U.S. is due upon submission. Payments will be made with the application submission online. Fort Worth Opera retains the right to select fewer than six works for the showcase. More details are available at http://www.fwopera.org/operas/frontiers/. Summer is here and Philharmonia Baroque Orchestra is hard at work on many exciting projects! Next month brings an exciting co-production when PBO joins forces with National Sawdust on a radical re-imagining of Handel's dramatic cantata Aci, Galatea e Polifemo (an earlier version of Handel's Acis and Galatea). The project is led by star countertenor Anthony Roth Costanzo, whose recent appearances in Handel's Partenope at the San Francisco Opera were reviewed to critical acclaim. He's received the highest accolades for his performances at the Metropolitan Opera, Lyric Opera of Chicago, among many others. Aci will be directed by Olivier Award-winning director Christopher Alden, who also directed Partenope at SF Opera and has enjoyed a distinguished career in directing projects for the English National Opera, Canadian Opera Company, and Glimmerglass Festival. Clay Zeller-Townson will lead the new period instrument ensemble, Ruckus, a group of recent Juilliard graduates. Clay has appeared with Tafelmusik, Trinity Wall Street Baroque Orchestra, Boston Baroque, and many others. Cath Brittan, production director from Le Temple de la Gloire, will co-produce. The production is billed as a spectacular, streamlined, cliff-notes version of a Handel opera and will use innovative video technology to create multi-dimensional visual landscapes and re-imagined recitatives by composer and sound designer Mark Grey. The intimate National Sawdust space in Williamsburg, Brooklyn, is a center known for its work with Phillip Glass, Laurie Anderson, Renee Fleming, and other artists. This project is a perfect complement to PBO's New Music for Old Instruments initiative - to produce, commission, and perform new and reimagined works written expressly for period-instruments. The National Forum of Music in Wroclaw, Poland, announced that Giancarlo Guerrero is to be the Music Director of the Wroclaw Philharmonic starting in the 2017-18 season, succeeding Benjamin Shwartz. Guerrero will conduct four weeks during his first season in Wroclaw, and starting with the 2018-19 season, he will spend eight weeks per season with the orchestra in addition to touring and recording activities. Guerrero will continue in his role as Music Director of the Nashville Symphony, a post he has held since 2009 and to which he has committed through the 2024-25 season. The Witold Lutoslawski National Forum of Music in Wroclaw is located in the historic center of Wroclaw and operates a state-of-the-art multifunctional concert venue which opened in 2015. The acoustic and theater design of the concert halls was the work of the renowned New York based Artec Consultants Inc (now Arup) and led by Tateo Nakajima. The building of the NFM has been designed by the esteemed polish architect Stefan Kurylowicz and the Kurylowicz & Associates Architectural Design Studio.The NFM presents an international orchestral series which in this current season included the Bayrischer Rundfunk and Staatskapelle Dresden among others.